He warned the National Library of Ireland that a planned display of his grandfathers manuscripts violated his copyright. (The Irish Senate passed an emergency amendment to thwart him.) His antagonism led the Abbey Theatre to cancel a production of Joyces play Exiles, and he told Adam Harvey, a performance artist who had simply memorized a portion of Finnegans Wake in expectation of reciting it onstage, that he had likely already infringed on the estates copyright. Harvey later discovered that, under British law, Joyce did not have the right to stop his performance. In Dublin, where I live, there is already a palpable sense of transition into a post-Stephen era. Last Friday I went along to Swenys, the pharmacy on Lincoln Place made famous by the scene in Ulysses where Bloom purchases a bar of soap with a sweet lemony wax in advance of a trip to the public baths. Swenys ceased trading as a pharmacy in 2009, and is now a museum and bookshop preserved in its turn-of-the-twentieth-century form. A public reading from The Dead was due to take place in the tiny shop, but an unexpectedly large crowd and the presence of a film crew forced the event around the corner to the bar of the Montclare Hotel (itself a watering hole much frequented by Joyce in his youth). There, copies of Dubliners were handed out to everyone who showed up. The gathering was composed mainly of actual Dubliners, and it was lovely to hear the story being read aloud in the voices of the city it celebrates, on the date on which it is setJanuary 6th, the feast of the Epiphany. The reading was a reminder of what public domain actually means: Joyces work now belongs to the people. Meanwhile, a few minutes walk across the city, a play called Gibraltara selective adaptation of the parts of Ulysses that deal with the relationship between Leopold and Mollywas beginning its run at The New Theatre in Temple Bar. Later in the year, the theatre company PanPan will mount a production of Exiles, Joyces only play, which it plans to take on a world tour. RTE, Irelands national broadcaster, is planning to broadcast regular readings from Ulysses, Dubliners and A Portrait of the Artist as a Young Man. Had Stephen Joyce not lately been divested of his powers of obstruction, none of these events would have stood a chance. Given that professional Joyce scholars have been more directly affected than the general public by the estates vulgar displays of power, I wanted to get a sense of the reaction within the academy to the expiry of E.U. copyright. Sam Slote, one of the academics D. T. Max interviewed, now teaches English literature at Trinity College Dublin, and is a prominent figure in Joyce studies. When I spoke to him, he was careful to disabuse me of any impression that the estate might now be out of Joyce scholars lives for good. He pointed out that the status of the posthumous publicationsthe letter and manuscripts, for instance, as well as Stephen Hero (an unfinished autobiographical novel which Joyce radically revised as A Portrait) and Giacomo Joyce (a fragmentary, poetic account of Joyces relationship with a female student)is still unclear. Until that status is made explicit, he told me, there is going to be a mood of extreme caution among Joyce scholars. He and a number of others have signed a letter to Irelands Arts and Heritage Minister looking for clarification of the legal status. 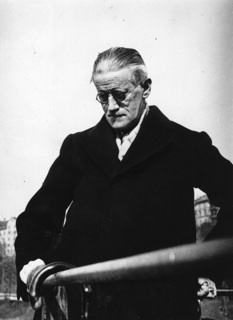 It is true, of course, that its no longer necessary to ask permission from James Joyces representative on earth in order to quote from the work he published in his lifetime, but a significant amount of scholarship draws heavily from the manuscripts and letters, so it is inaccurate to view the recent copyright expiry as marking the beginning of a new era in Joyce Studies. The near future will nonetheless see a swell in publication of Joyceana, with a number of new editions, anthologies, and translations lined up. Sean mentions that major new editions of Finnegans Wake, Ulysses, A Portrait, and Dubliners are soon to be published, all of them coming out of Europe (in the U.S., Dubliners and A Portrait have already been out of copyright for some time). A new Italian Ulysses is due later in the year, and Sam Slote is preparing a heavily annotated version of the novel for publication, a reprint of a text that came out in Joyces lifetime. Sean Latham agrees that there will now be somewhat less quality control on Joyce publications, but sees it as not such a terrible development, pointing out that no one is much concerned about there being too many editions of Dickens or Shakespeare. As with most advocates of Joyces work, he thinks anything that might bring it to a wider readership should be welcomed. When I made a joke about the possibility of a first-person-shooter video game of Finnegans Wake hitting the stores in 2012, he mentioned that he himself has had pipe dreams about a Ulysses game. I have an undergraduate student, he said, and we fantasize about exactly how such a thing might be devised. I know there is a Jane Austen video game being designed, so a Ulysses video game cant be far behind. If any game developers happen to be reading this, I hope they take note. A simulated ramble around Edwardian Dublina sort of Grand Theft Auto without the theft or the autoscould make for a powerfully immersive gaming experience. It would almost be worth doing just to see how Stephen Joyce might react.